I just can’t seem to get serious about quilt series. Usually I lose steam about the third or fourth iteration, and my current series is no exception. As is often the case, my Nancy series began by accident. I attended a presentation on Nancy Crow’s way to create quilts, and we attendees played around with slicing and dicing solids using her methods. I sewed together most of the solids scraps I owned to create several starts of what I’ll call pieced cloth. The first completed top was “Not Quite Nancy,” in which I included prints and circles. Many of you commented on this one while it was in process, and it is the better for those comments. The tag at the top is the dimensions. Next, I finished off a smaller piece I named “Nearly Nancy” as it was made totally with solids. Oops, there’s one bit of almost solid fabric. I think the binding color sets off the other colors nicely. It’s actually quilted. Then, I went Anni Albers with “Nod To Nancy,” which is more regularly pieced, though still asymmetrical. It’s quilted but the edges need to be finished. The waviness is in my piecing, not your screen. Finally I devised “So Not Nancy,” which features two densely pieced blocks surrounded by shades of red and a bit of blue fabric I dyed. The large unpieced blocks run counter to the Crow method of dense piecing. Right now I have just a few pieced fabric starts left. They’re in my parts department so they may show up in future work. Of course, I have yet to quilt two of the above tops, so it’s not like I have nothing to do. I expect you noticed I quilted the smaller ones first. I really like your Nancy Crow series. They are very colorful and have fun designs. Thanks. Working abstractly reduces design to basics, which I find freeing. Wow, thanks. I find I can either concentrate on color/value or subject matter. I find combining them to be hard. You sound like you’re rather “done” with it, having lost steam. Will you keep using these techniques in future works? What did you like about the process, or not like? Are you suggesting a swap or a show? Seriously, the chief reason I’m at the end of this technique is the amount of cutting involved. You piece, crosscut, piece, crosscut, and so forth. It’s how you can get interesting made fabric. Unfortunately, all that cutting through increasingly thick layers (those seams!) causes my shoulder issues to surface. 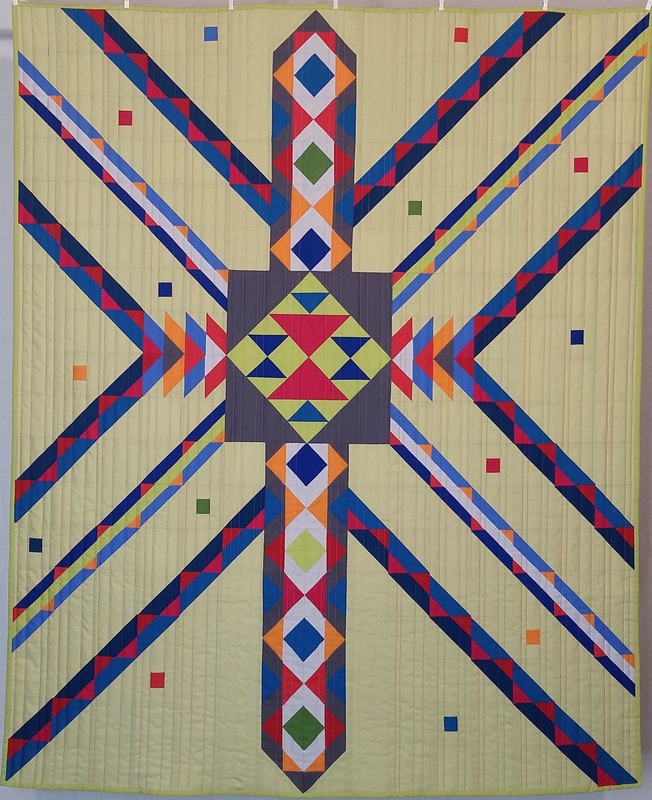 I’d love to follow along with the techniques in Maria Shell’s new book, “Improv Patchwork:Dynamic Quilts Made With Line and Shape,” but I don’t want to revisit the orthopedic surgeon. So, I’ll use up the stripes and bits I’ve already made eventually, but I don’t see creating any more. I understand the shoulder problem. I got a severe case of elbow tendonitis a few years ago cutting and building blocks for guild kits. It took an awful long time to resolve. Better you take it easy, or get someone else to do your cutting for you.